Waka Flocka Flame is an American rapper signed to Atlantic Records and Brick Squad Monopoly. 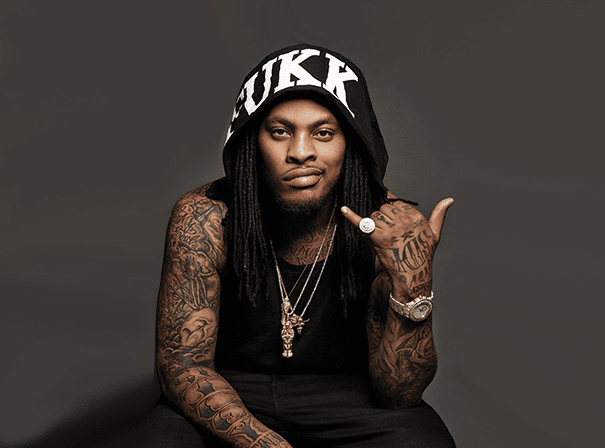 Releases like “O Let’s Do It”, “Hard in da Paint” and “No Hands” have sat pretty in Billboard’s Hot 100 chart and to date he has released two critically acclaimed studio albums Flockaveli and Triple F Life: Friends, Fans & Family. A third album, Flocakveli 2 is set for release any time soon and features the likes of Wyclef Jean, Busta Rhymes and Timbaland with production from 808 Mafia, Lex Luger, Mike Will Made-It and Black Metaphor. Following on from that, Waka Flocka Flame is also set to release a new EDM album entitled Turn Up God. Known for his free flowing styles and brutally honest lyrics, which touch on subjects ranging from the music industry to personal relationships, Waka Flocka Flame is a rambunctious personality on the microphone and has a real sense of stage presence. Always captivating audiences both live and from the studio, Waka Flocka Flame is a very real artist with a very real talent.